IN the world of tourism, many people from other countries view Papua New Guinea as nothing more than a corporate destination, according to a local hotel manager. Miharu Kawabata, whose mother is from East Sepik and her father from Japan, has links to the Paradise New Wewak Hotel, whose owner, Shizuka Kawabata, is her father. Miharu was at the PNG Tourism Hospitality Expo in Port Moresby about two weeks ago – and she was excited to be there. “I find the expo is very good as we get to do good networking and meet other hotels, learn from their experience and how they go about in their business,” she said. Recently, she was at a South Pacific Tourism Expo in Sydney. “That was our first time to attend which was really good as we saw hotels in other countries and how they promote tourism and hospitality. Kawabata said attending hospitality meetings here and abroad is one of the surest ways for people in the hotel and tourism industry to get ideas by speaking to other people who have the same interest, and staying at lodges and hotels which allows one to see what others have and provide. Paradise New Wewak Hotel is perched atop Wewak Hill with a magnificent view of the outlying islands. Originally known as Wewak Hotel, it was built before the independence. Kawabata’s father took it over in 1981 and changed the name to New Wewak Hotel in 2000. “In 2005, the hotel was reregistered, as per the Company Act 1997, so the name changed to Paradise New Wewak Hotel (and) that is the current trading name. The hotel works with Sepik Adventure Tours for sightseeing arrangements along the Sepik River. They organise the island tours themselves. “The tourism industry during the late 1970s coming up, had bigger groups of tourists, nearly up to 100 can come in at a time.” Now it’s about 20. 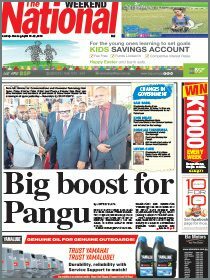 “I think this might be because there is not enough marketing and advertising to promote Wewak as a tourist destination. Paradise New Wewak Hotel gets frequent visits from tourists going into Wewak on cruise ships. The visitors go into the hotel for refreshments after visiting memorial sites or after a wander around town. Kawabata added that people’s behaviour and attitude is also a challenging factor. “Before we start promoting tourism we have to really educate our people, our young generation on attitude and hygiene. 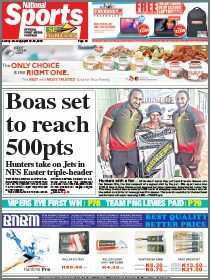 There are a few hotels in Wewak and Kawabata said the competition is not as fierce as in other places such as Port Moresby, Lae and Kokopo.